Posted by dasadmin & filed under Answering Services. When you work with a highly professional call center, your calls become the focus of a very defined infrastructure that supports your customers 24 hours a day, 7 days a week, 365 days a year. At the center of that infrastructure is a map of how your calls are taken and routed. This is called your “call flow”. The goal of an effective and efficient call flow process is to make certain that none of your customers’ calls slip through any cracks in the call process. 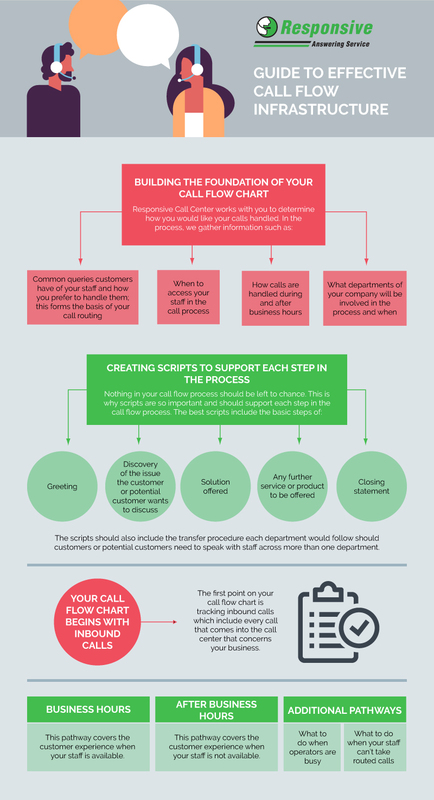 Take a look at the following infographic that explains how we at Responsive Answering Service work with you to create the best call flow for your business, including how calls are routed and the different steps in place before and after speaking with an agent to ensure proper management and expectations are in place for an outsourced solution. For more than 40 years, Responsive Answering Service has created and managed call flow for numerous industries, including medical, legal, transportation, commercial services (HVAC, landscaping, locksmith, plumbing, real estate, and property management) construction, energy & utilities, government agencies, leisure & travel, and charities. We have available all day, every day, to handle your calls the same way you or your team would so you do not have to rely on answering machines or automated systems. Our state-of-the-art equipment at Responsive Answering Service and highly trained staff allow us to make sure you never miss your customers’ calls. Contact us to discuss how Responsive Answering Service can help your business best manage the calls that are most important to you.